It’s that time of year again! 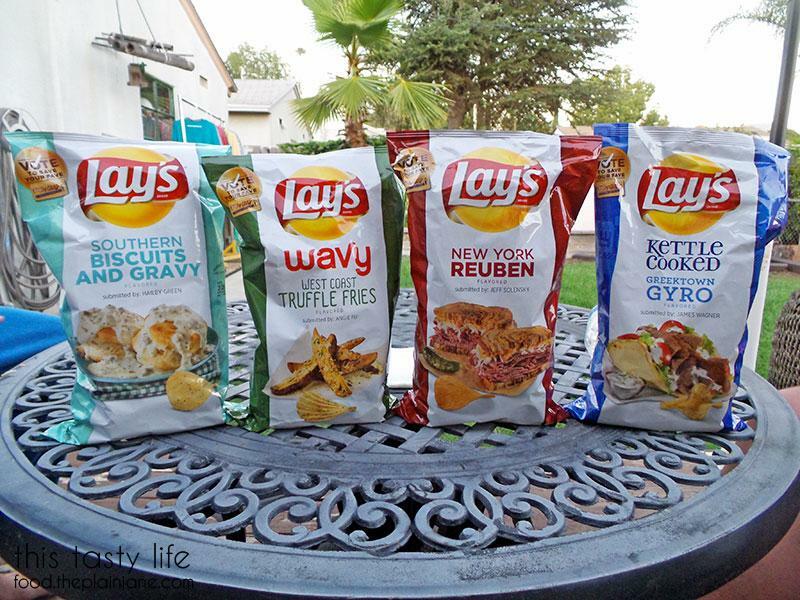 Lays Chips has released a new batch of weird-o flavors onto the public for us to vote on. Jake, T and I tried this out last year so let’s see how these “Do Us a Flavor” Lays Chips fair this time around. Here are the crazy new flavors: Southern Biscuits and Gravy, West Coast Truffle Fries, New York Reuben, and Greektown Gyro. 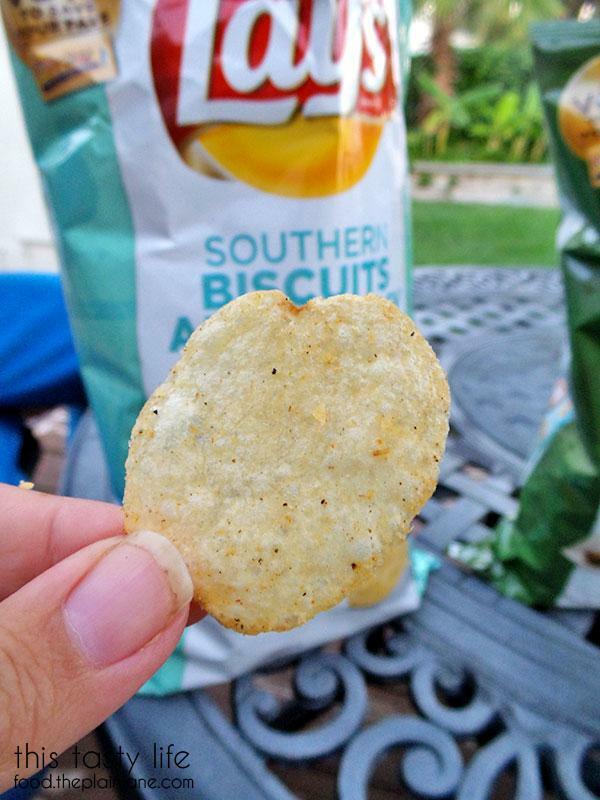 The Biscuits and Gravy chips are the first ones we tried out. They’re just the regular thin chip. When we sniffed the bag it TOTALLY smelled like sausage gravy. It was kind of odd. Reactions were mild to this one. It was kind of a “whoa, that… really does taste like biscuits and gravy” reaction mixed with “but do I really LIKE this?” The chips were oddly sweet. We concluded these were “okay” but that the sweetness was a bit of a turn-off. The Truffle Fries chips were wavy and slightly thicker. They looked like sour cream and onion chips, but wavy. The reaction again was sort of, “Hmm.. do I like this? I better eat another one.” The truffle flavor comes through a bit more strongly the more you eat the chips and they have an excellent crunch to them. I really liked these! Jake and T didn’t love them but thought they were pretty decent. I was already dreading this flavor since I already don’t like reuben sandwiches. These are thin, regular chips. Annnnnnd, the reaction photos. Clearly Jake and I did not enjoy these while T thought they were kind of good. He commented that they “just tasted like pickles” to him. This is the only one that I spit out immediately after eating. Jake can’t stand corned beef and thought these were the worst of the bunch (so I did). These chips have a really sour flavor and they smelled just like corned beef (so weird). 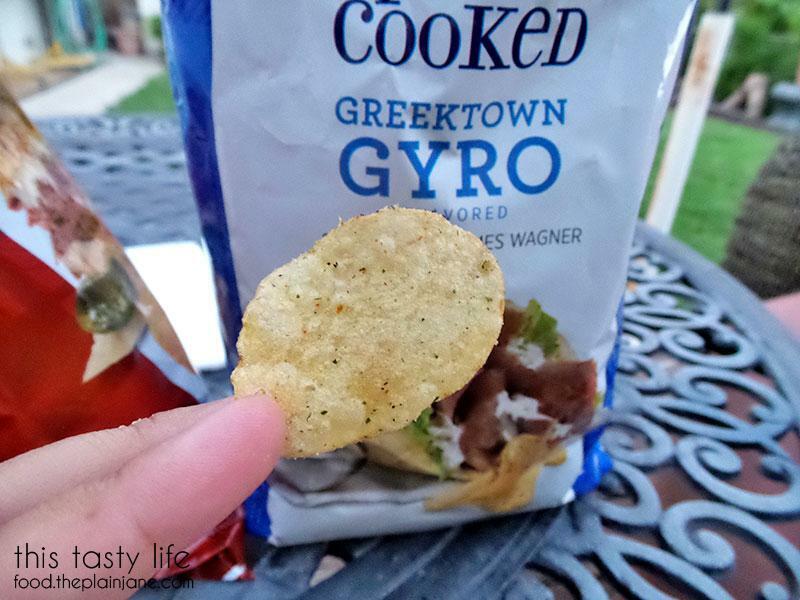 Last but not least are the Greektown Gyro chips which are kettle cooked. I look like I’m trying to figure out what the hell I’m eating since these didn’t taste ANYTHING like gyro to me. I don’t even know what they tasted like except some odd combination of spices. T thought these were the worst of the bunch and Jake… well, Jake doesn’t look very thrilled, does he? The winner for us overall were the Truffle Fries chips and over the last few days, are the only ones I’ve gone back to eat again. We found our chips at Vons and Food 4 Less if you’re interested in trying out these crazy chips for yourself! Hahaha! I went to an impromptu bbq and used it as an excuse to buy the chips (Stater Bros!) AND leave them at someone else’s house. I thought the biscuits and gravy chips tasted the most like what the bag said they were, but we didn’t really love them. 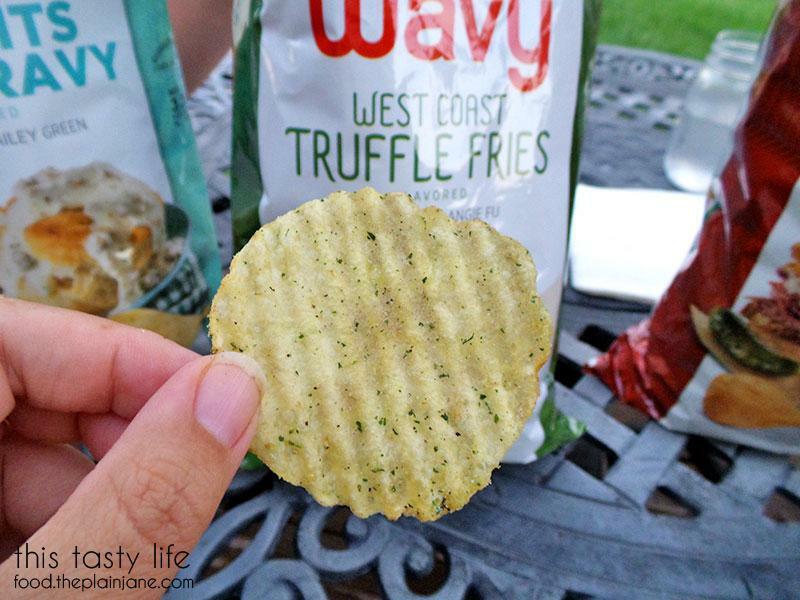 The truffle chips were the favorite, even though we didn’t think there was enough truffle flavor. The rueben was okay (I like a good pastrami sandwich) and I didn’t even bother buying the gyros ones. I was just at Walmart and saw they had mini bags of the chips – that would have been perfect for just a taste! Oh man I wish we had gotten just the small bags, haven’t seen the small bags anywhere yet. That would have been perfect! Nice idea to leave them at someone else’s house, haha! Haha I love the “reaction” faces from all of you guys! I really want to try the biscuits & gravy flavor and the truffle flavor now! 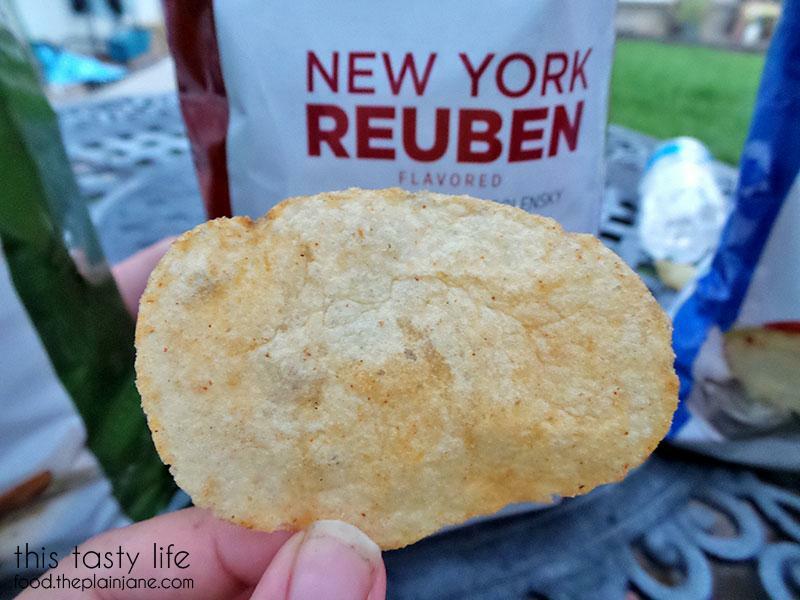 I don’t hate Reubens but it’s hard to imagine corned beef on a chip! Heehee, thanks Jinxi! I never eat reubens because it sounds like all kinds of gross to me. Putting that whole flavor of something I dislike into a chip was not pleasant, haha. OMG the reaction photos are perfect!!! I had the opportunity to try the biscuits and gravy and reuben at a friends house – they opened the bags fresh and we each tried one and they promptly sent the bags home with us where we threw them away! I could tolerate the biscuits and gravy but the reuben…yeah, my face looked just like Jake’s. We managed to finish the Truffle chips (or well, I finished them at least). I brought the Biscuits and Gravy chips to work one day for our breakfast day as a joke. Everyone wanted to try them but just a few chips were enough, haha. Hilarious reaction shots, especially Jake’s for the 3rd one. The gyro one sounds disgusting. Same with the truffle one. They may as well make a foot odor flavor, geez. I think I might like that Reuben because I like corned beef but if it’s sour, then maybe not. PRICELESS reaction pics! It’s like from a comedy sketch. I like the sound of Biscuits & gravy chips for some reason 🙂 What if it said the recipe was from Keith’s. Hmmmmm…..
Why were the Truffle Fries “West Coast”? Hi Faye – I love that we always reminisce about good old Keith’s. Their biscuits and gravy were never strangely sweet though! It needed a more savory spin on the chips. I have no idea why it’s west coast truffle fries. I’m sure they eat truffle fries on the east coast? I’ll confirm when in in Boston, hehe. The reaction pictures are even better than the crazy flavors. Since none of them were ‘winners’, i’ll stick to my usual boring but enjoyable bbq flavor, etc. Hi Lynn – they’re fun to try but I’d probably stick with sour cream n onion (or the ruffles cheddar & sour cream). I once tried these grilled cheese chips from Target but they were disappointing. Just clever marketing tricks. Sigh. haha, I love the reaction shots! I basically felt the same. The truffle one was my fav of the bunch, followed by biscuits and gravy. The other two..ugh.. Thanks Kirbie! I might even want to buy the truffle ones again in the future! The biscuits and gravy were a little too odd for me to want to have again and the other two… yeah, just throw those into the trash. We just bought the mini chip bags at Walmart, only $1.28. Only 2 flavors were available in the mini size. I actually liked the Reuben but absolutely HATED the gyros. It reeked of feta cheese which equals barf to me. Seriously I wanted to scrape my tongue raw after tasting that one chip. I wish we had looked for the mini chips but it’s okay. It was all for RESEARCH! I honestly didn’t taste feta when I tried the gyros, but I’m not sensitive to it like you are! I just know those chips tasted gross.